Last May a massive two-volume history of Jewish Hungarians appeared. When I say massive I’m not exaggerating. Géza Komoróczy, professor of Assyrian and Hebraic Studies at ELTE of Budapest, spent ten years on the research for this comprehensive 2,400-page study. He paid special attention to the neglected Middle Ages. Komoróczy is unique in the sense that he is not Jewish, which is considered to be an oddity nowadays in Hebraic studies. Interestingly enough, in the nineteenth century it was mostly non-Jews who worked on Jewish history; they were the pioneers in the field. The book is expensive, yet the first edition sold out and the publisher is reprinting it. After the book appeared Komoróczy was interviewed extensively. It was in one of these interviews that Komoróczy talked about the beginnings of Hungarian Jewish history–and the beginnings of Hungarian history as a whole. The link between the two is the Khazar Empire, whose political elite converted to Judaism. It is known that the Hungarian tribes at one point were under the supremacy of the Khazars. It is possible that the Hungarian chieftains followed the Khazar religious example since they adopted many Khazar customs. One clue is that Hungary’s third king was a certain Aba Sámuel, most likely the nephew of St. Stephen. Scholars doubt that he followed the Jewish ritual, but it is likely that he came from a family in which the Judaic tradition was strong. Or there is King Salamon (1063-74), son of András I. That’s why Komoróczy jokingly said in the interview that if there was a Jew among the Hungarians who arrived in the Carpathian Basin it was Árpád himself. You may recall that Arthur Koestler wrote a controversial book entitled The Thirteenth Tribe outlining his hypotheses about the Khazar origins of European Jewry. 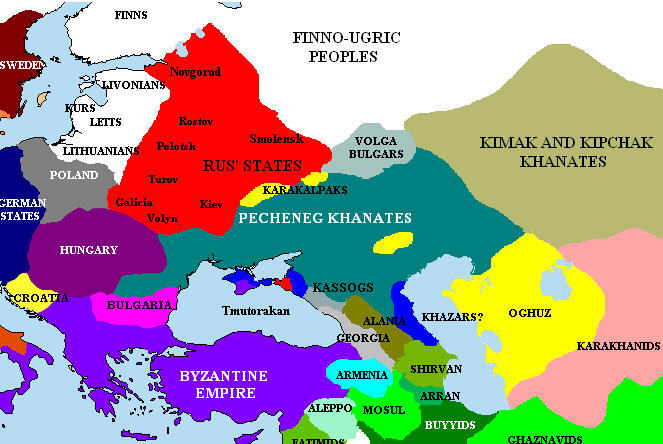 The Khazars were a Turkic people who lived in the region of the Caucasus. As was so often the case in this region, the Khazars were pushed westward by invading armies from the East and settled in present-day Russia, Ukraine, and Poland. Koestler argued that proving that Ashkenazi Jews had no biological connection to the biblical Jews would remove the racial basis of European anti-Semitism. Now there is a new study by Eran Elhaik, who published an article in the most recent issue of Genome Biology and Evolution entitled “The Missing Link of Jewish European Ancestry: Contrasting the Rhineland and the Khazarian Hypotheses.” The Rhineland hypothesis describes Eastern European Jews as a “population isolate” that emerged from a small group of German Jews who migrated eastward and expanded rapidly. Elhaik concentrated on a possible DNA link between the Khazars and present-day European Jews. But there was a bit of a problem. The Khazar population disappeared somewhere on the steppes of Russia. So Elhaik studied first the DNA of people of the Caucasus today, altogether 74 ethnic groups, and compared them to eight different Jewish groups, among them some from the Near East. He came to exactly the opposite conclusion from Kleiman. According to him, European Jews are most closely related to the Turkic-Iranian ethnic pool, although there are some Semitic strains as well. Elhaik’s explanation for the Semitic strain is that Semitic people also migrated to Khazaria from the Near East, specifically from Mesopotamia and Judea. These groups settled in the southern parts of Khazaria where today Georgians and Armenians live. The researcher claims that the closest genetic relationship of Ashkenazi Jews is with the Armenians of today. According to Elhaik’s account, the DNA of today’s Jewry comes from three different sources: (1) the non-Semitic Khazars, (2) the Jews who settled in the Greek and Roman Empires, and (3) the Jews of Mesopotamia and Judea. But then where does the Yiddish language widely spoken in earlier times by Jews come from? Although it includes Hebrew words, it surely has its roots in the German language. That would support the Rhineland theory. Koestler’s answer to this was that during the Middle Ages most of the cities of Eastern Europe were inhabited by Germans. This was certainly true of Poland, and of Hungary as well. Koestler pointed out that since Jews were not allowed to own land they had to settle in cities where they picked up more and more German words. I guess one can have two completely different results from DNA research. Therefore, unlike Origo, which confidently entitled its article on the subject “The genetic foundation of anti-Semitism is disproved,” I find it difficult to wholeheartedly embrace this new theory. I would like to know, for example, what language these Jewish Khazars who moved to Poland spoke. And are there any traces of a Turkic language in Yiddish? Whatever the case, let’s be satisfied with the likelihood that the Khazar influence on the early Hungarians also meant that high Hungarian officials converted to Judaism alongside the Khazars. I’m pretty sure that this is shocking enough to our anti-Semites. As I was listening yesterday to the rendition of the American national anthem as sung by that gorgeous looking woman with a great voice I had to think about this mania about the Hungarian national anthem. I.e. that it can be played or sung the official way only. I don’t know of the origins of the Hungarian national anthem – but it sounds like a right funeral dirge to me! I’ve looked up the origins on wikipedia – apparently from 1823. Time for a new one? – Perhaps when Orban’s gone? @Charlie FYI In an 1906 recording, they play Rákóczy Induló (Rákóczi March) which is told to have been used as an unofficial anthem for some time two centuries earlier. It is still used on some “non-mainstream” occasions although it is also associated with military happenings/events. About Erkel’s anthem, there are opinions that it was only made more to sound like a funeral after the Treaty Trianon in 1920 by Dohnányi Ernő. These opinions are questioned by others. The discussion got more active by changes in the law some years ago. This should be easy to check, the musical notes include the rhythm. I assume the original Erkel notes are archived somewhere. Actually the three kabar tribes of khazarian origin who joined the Hungarian confederation rebelled against the Khazar Khaganate, (see wiki Khazar Khaganate http://en.wikipedia.org/wiki/Kabar). Mikhail Artamonov, Omeljan Pritsak and others have speculated that the revolt had something to do with a rejection of Judaism. Though is believed that both the Kabars and mainstream Khazars had pagan, Jewish, Christian, and Muslim members. And indeed Judaism was spread mostly in the elite, while the commoners where mostly Muslims or Christians. I have read all the above comments – I passed over some of them rather quickly – and am most impressed by Bob Cohen’s single contribution of 20 January 2013. Two points I would like to make: Koestler didn’t invent the arguments he put forward in “The Thirteenth Tribe”; they were based on books by Poliak, Patai and Dunlop – see Wikipedia. Secondly, religion and politics should not be mixed in scientific discussion. Koestler had a well-meaning agenda: I should like scientific evidence. If Elhaik’s latest DNA findings are correct, they should be accepted – whatever the subsequent implications for politics.